(Washington, D.C.) — In 1963, leading members of a synagogue in Ohio launched the Cleveland Campaign for Soviet Jewry – the first group in America to seek to call attention to and generate support for Jews in the USSR who were being subjected to vilification, severe repression and incarceration in the gulag. In the years that followed – with the help of Holocaust survivor Elie Wiesel, student activists, the wife of a prominent Soviet refusnik, Avital Sharansky, and the State of Israel – from this humble beginning, a formidable political force was born. A centerpiece of this campaign to save Soviet Jewry was the prominent display of signage outside of synagogues across America to call attention to the plight of those persecuted Jews. It engaged worshipers, passers-by, journalists, business leaders and politicians, alike. It also inspired mass demonstrations in the United States and overseas. Along the way, the campaign also showcased the stories of courageous Jews seeking to emigrate from the USSR. Bracelets bearing the names of such individuals and countless others became popular expressions of solidarity; President Ronald Reagan kept one on his desk. 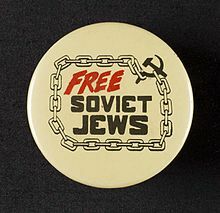 The Save Soviet Jewry movement was ultimately given political expression by an amendment adopted with overwhelming bipartisan support at the initiative of Sen. Henry M. “Scoop” Jackson (D-WA) and Rep. Charles A. Vanik (D-OH) in 1974. The Jackson-Vanik amendment to the Trade Act of that year tied non-market economies’ access to Most-Favored Nation (MFN) status to their allowing freedom of emigration. The Soviets refused to agree and thus were denied the ability to tap into U.S. investment, financing, credits, technology transfers and other forms of what would have amounted to economic life-support for their failing system. As a result, when President Reagan adopted a strategy in 1983 for destroying the Soviet Union that entailed, among other things, waging economic warfare against the Kremlin, the absence of such an MFN-enabled safety net contributed greatly to the demise of the USSR. There are, obviously, numerous differences between saving Soviet Jewry from the oppression of one, albeit very powerful, country and saving Christians from the persecution they are facing worldwide. Still, the possibility of using techniques that proved successful in the former case to help with the latter challenge cannot be ignored, given the stakes. That is especially so in light of the opportunity presented by today’s social media to help exponentially raise awareness and enlist support worldwide – a force-multiplying capability unavailable to, indeed unimaginable for, the previous generation’s human rights and religious freedom advocates. (Washington, D.C.) — Christianity.com reports that more Christians died for their faith in the last century than through all the years since Jesus’ day combined. Unfortunately, the mass persecution of Christians is increasingly characterizing our time, as well. In fact, the Center for the Study of Global Christianity estimates that between 2005 and 2015, 900,000 Christians were martyred. 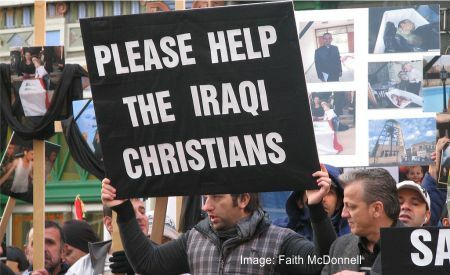 The Christian population of Iraq alone has plunged from 1.5 million in 2003 to 275,000. Experts believe that number could soon go to zero.According to the Center for Studies on New Religions, in the past two years, Christians were the most persecuted group in the world.Despite the best efforts of many faith leaders and organizations in the West, the rapes, church burnings, crucifixions, enslavement and murders of Christians continues in the Middle East, Africa and elsewhere.